Healthy, delicious and totally nutritious! These balls of sheer loveliness are bursting with vitamins and they are an absolute cinch to make. I keep a stash in my fridge and help myself to one any time I feel a bit peckish. I have a very sweet tooth so they are the perfect snack/treat/mid-meal energiser to keep me nourished and re-fuelled. You will need: 1 cup cashews, 1 cup dates, 1 tbsp raw cacao powder, 1 tbsp pitaya powder, 1 tbsp water. Method: Simple! 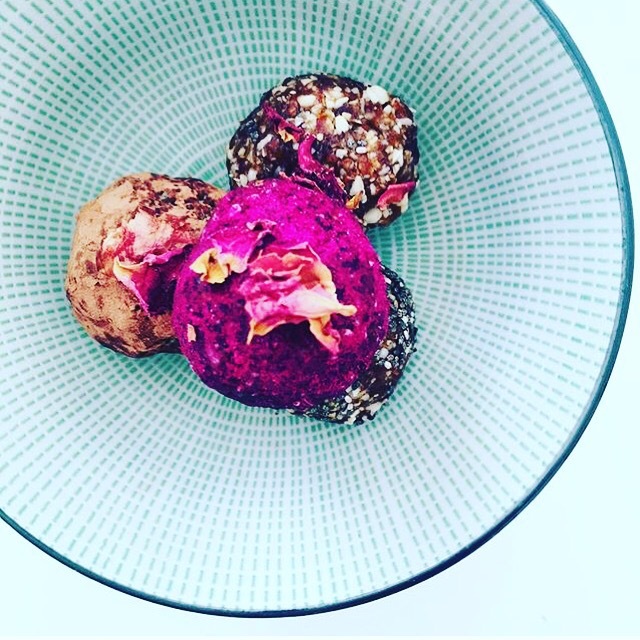 Just food process all ingredients (except pitaya powder), roll mixture into balls and cover in vibrant pink pitaya 💗💗💗 chill in fridge and serve! Rose petals optional.